I love a great salad, and I've been eating this one for lunch (a lot). When I really like something I tend to stick with it and repeat often. This salad in particular is a great example of our salad formula in action. With different textures, protein, and healthy fats, it keeps me full and my cravings at bay. On Sunday, I shop and prep so it's easy to throw together during the week when things get hectic. I saute the chicken with Jakes Prime and cumin, cook brown basmati rice (I use the quick-cook from Trader Joe's - done in 15 min), chop the veggies, and house everything in clear containers in the fridge so that there is little to no prep work during the week. What's in this salad? 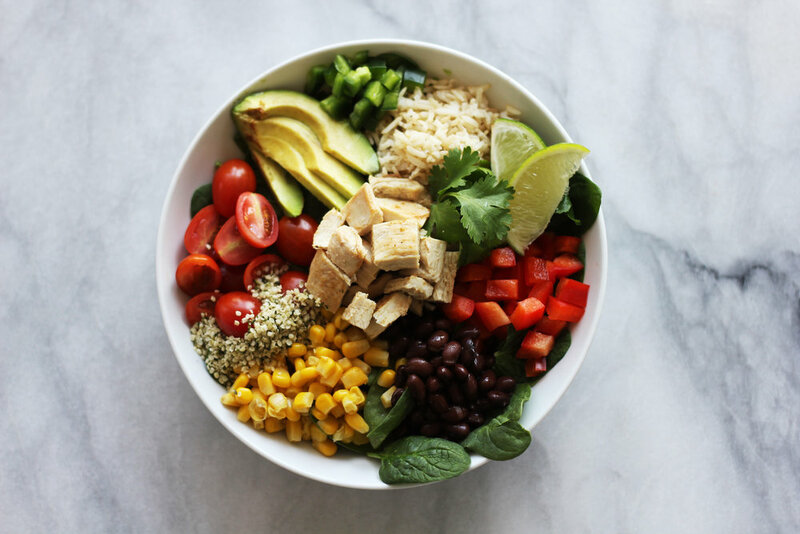 You're looking at: Baby spinach, cherry tomatoes, black beans, red bell peppers, avocado (only 1/4), corn, fresh jalapeno, cilantro, hemp seeds, brown basmati rice, and chicken. I dress it with a little olive oil, Braggs liquid aminos and lime. I've made this salad with beef and shrimp and subbed quinoa for rice and it's just as good. Make it your own with your favorite protein!